Chapter President Bob Laford welcomes 35 chapter members and friends to the 2004 Christmas Party. Our first stop for the new year. Breakfast in Rindge, NH. A crowd of 20+ gathered in Ashby for our Winter Pot-Luck. Only a few weeks to go and we will be on two wheels again! ...but in between we boarded the wrong bus and had a tour of Boston through Chinatown, Roxbury, Dorchester, and the Boston Common. And we had a chance to ride the Red Line, Orange Line, Green Line, and Silver Line! Someone asked if we picked the restaurant (Hooters) just for the food. It's always a lot of fun when we head to Ontario to visit our friends from Ontario-7. Each February they hold their "Winter Frolic" Dance -- the dance is only a little piece of all the fun we have and all the hospitality we enjoy! Cliff is showing off his bullseye... I think Stan let him win to make him feel good! A stop at the local pub is always on the agenda as well. Need to help the Belleville economy! We have been watching the reconstruction of this WWII Halifax for a number of years. The plane was rescued from a Norweigen lake where is ditched after being shot down. The plane was recenlty moved into a new section of the RCAF Museum at the Trenton Air Base so it could be assembled and displayed. A special thank you always goes out to our hosts Stan and Lise. Here Diona and Marty sneak up on Stan at the chapter Dance. A beautiful spring-like day greeted us when we traveled to Boston for our annual walking tour and North-end dinner. Fifteen members and friends met up for the train ride into the city. Headed back to the "TD-BankNorth Garden," um.. the North Station, we went through Hay Market Square to check out the fresh produce and hawkers... and the crowds! After the parade we were off for brunch at Johnson's Sugar House and a ride under bright blue skies! At our Spring meeting the portable HP Parking sign in the parking lot had more miles on it during the afternoon than the bikes parked there! Every bike got "tagged" with the blue sign, but here the sign ended up next to Bill C's bike. Our 2005 Cape Cod Weekend was all wind and water! The rain started Friday night, Saturday and Sunday were rain and winds near 60 MPH, and when the final members of the chapter left on Monday morning it was still raining! But we still had fun. 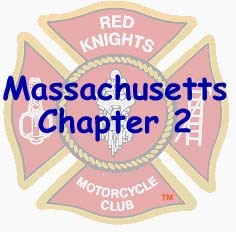 Red Knights Mass-8 and the Orleans Fire Department were planning a benefit ride for two of their firefighters who were injured when a drunk driver crossed the center line and hit their ambulance head-on. Pictured here are Mass-2 Treasurer Cliff Eldridge and President Bob Laford presenting Mass-8's President Bob Felt and Past-president Chris Olsen with a chapter donation to kick off the fund drive. Even though the rains came we did get a chance to sample different fares. Here members are relaxing at the Land-Ho restaurant in Orleans. A stop at the Hardwick Winery is always a good time... I like the one made with Cranberries! A stop at the Enfield Lookout at the Quabbin Reservoir gave us a great back drop for our picnic lunch. July 4th weekend had some exceptionaly good weather... so a few of us got together to enjoy a ride through the Connecticut River Valley and out to the Berkshires. Our CT-Valley Ride appeared in the April 2006 edition of Backroads Magazine! Stopping at Holy Smokes... where your BBQ prayers are answered! Trying something new... with a Pig Roast! Tropical Storm Cindy wandered through the region Friday and into early Saturday, but Mother Nature cooperated and the rain let up and the roads began to dry out before we went for our ride and ended up at our hosts home for some great food... and much more than just the pork! Out for a ride to New Hampshire on a fine summer day... for ice cream! This stop in Milford, NH, we are told, is where Peg would come for ice cream when she was a little girl! Marty and Cliff at their new summer place in Wells, ME. Ready for Ashburnham FD's 150th Anniversary Celebration. The Red Knights led the apparatus parade. WOW! Sixteen bikes and nearly 30 people showed up for our ice cream ride in August. The Ride for Kids day started with rain, but the time the ride started the clouds were all that remained. Nearly 200 bikes made the ride from Oxford to South Hadley raising over $61,000 for the Pediatric Brain Tumor Foundation. Thanks to all who participated and to all who donated. Who's that sitting on an HD? Chillin' out at the Kilhart's camp for a Labor Day Wekend BBQ. ...and the weather was just great too! Cliff and Marty Eldridge receive recognition for their years' of service to Mass-2 prior to the Killington Parade. Lined up at the parade. Headless horsemen causing some trouble! Parade participants continue to roll into the city of Rutland long after we already parked our bikes! Deb explains to Ed which piece of his birthday cake she would like during a stop at Teresa's restaurant in Ware while on our Polar Bear Ride.